When TriMet’s fall schedule goes into effect September 1, bus riders will see $2.1 million in minor changes and a new bus line. Even small adjustments can bring benefits – and increased ridership. That’s exactly what we saw when we streamlined some bus service last September. With this year’s fall service change, 11 bus lines will see adjustments made to schedules, routes and/or stops. The changes, including the addition of a bus line between Sherwood and Tigard, will help relieve overcrowding and improve schedule reliability. Two bus lines – Line 17-Holgate/Broadway and Line 70-12th/NE 33rd Ave – return to their regular route northbound over Powell Boulevard after being detoured for more than a year as a new overpass over Powell was installed as part of the Portland-Milwaukie Light Rail Transit Project. In 2012, ridership jumped anywhere from 29 to 39 percent based on minor changes. Here are some highlights of how these new connections increased weekday ridership while saving operating costs, allowing more funds to be reinvested in more and better service. Line 9-Powell buses now run more frequently in East County east of SE 102nd Avenue to Gresham. Ridership in that area has increased 29 percent. Line 87-Airport Way/181st, a long-anticipated cross-town line on NE 181st/SE 182nd Avenue, was created by combining two lines. Ridership has increased 28 percent on that stretch. Midday buses on Line 87 run along NE Airport Way for the first time, improving access to jobs including flextime options. Ridership there is up 39 percent. Line 70-12th/NE 33rd Ave, a new cross-town line linking Southeast and Northeast Portland neighborhoods, was created by combining Lines 70 and 73. 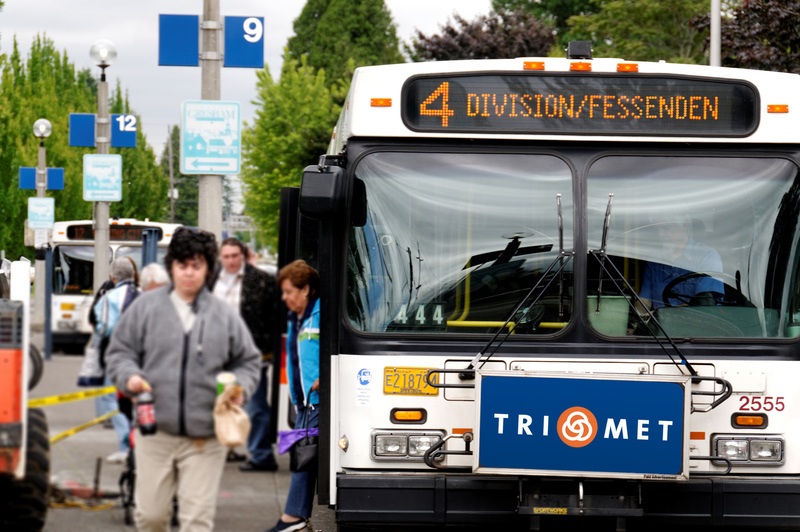 Ridership on NE 33rd Avenue increased 34 percent. Effective Sunday, 9/1, Line 4 will have increased frequency on weekends to help relieve overcrowding. See Line 4 information and schedules. Effective Monday, 9/2, Line 9 weekday service will start approximately 30 minutes earlier. See Line 9 information and schedules. Effective Sunday, 9/1, Line 12 will have increased evening frequency on the weekends to help relieve overcrowding. See Line 12 information and schedules. Effective Sunday, 9/1, Line 17 will return to its normal route along SE 17th Ave, connecting SE Powell and Holgate. See Line 17 information, schedules and route map. Effective Monday, 9/2, Line 21 weekday service will start approximately 30 minutes earlier. See Line 21 information and schedules. Effective Monday, 9/2, Line 47 will no longer serve the Sunset Transit Center. Instead, it will run between the Hillsboro Transit Center and PCC-Rock Creek. For trips to Hillsboro via Line 47, use the stop on NW 231st & Alder. See Line 47 information, schedules and route map. Effective Sunday, 9/1, Line 48 will have increased morning and afternoon rush hour frequency between Sunset Transit Center and NW Stucki Ave. Line 48 will serve a new stop closer to the Park & Ride at Sunset Transit Center. See Line 48 information, schedules and route map. Effective Monday, 9/2, Line 50 will serve a new stop closer to the Park & Ride at the Sunset Transit Center. See Line 50 information, schedules and route map. Effective Sunday, 9/1, Line 70 will return to its normal route along SE 17th Ave, connecting SE Powell and Holgate. See Line 70 information, schedules and route map. Effective Sunday, 9/1, Line 83 will run on weekends only through October. Service ends October 27 and resumes May 2014. See Line 83 information and schedules. Effective Sunday, 9/1, we’re adding the new Line 93-Tigard/Sherwood. The 93 will run between Sherwood and the Tigard Transit Center, and will serve all stops and run weekdays and weekends. See Line 93 information, schedules and map. Effective Sunday, 9/1, Line 94 will run weekdays between Sherwood and downtown Portland from approximately 5:45 a.m. to 7:30 p.m. The line will no longer serve Tigard Transit Center and will no longer run weekends. For weekend service between Sherwood and Tigard TC, take the new Line 93-Tigard/Sherwood. See Line 94 information, schedules and map.